Scarlett is a dog that appears in the theme Friends. She appears in three sets; 3188 Heartlake Vet, 41011 Soccer Training with Stephanie, and 3942 Heartlake Dog Show. She is Olivia's dog. 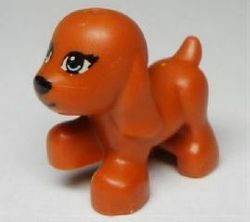 Scarlett has her own exclusive dog mould, she is a brown dog, her face is smiling with green eyes and eyelashes, over her mouth she has a black nose. There is a space at the top of her head for accessories, she wears a purple bow in 3942 Heartlake Dog Show and a light blue one in 41011 Soccer Training with Stephanie. Scarlett is similar to her appearance in the sets, exept she has a pink collar with a silver heart and a golden circle chains, she has a pink bow at the right side of her head. According to Mia's bio, Scarlett is her dog, though Stephanie mind her sometimes. Scarlett entered the Heartlake Dog show. When she got sick Mia and Sophie took care of her, Stephanie also plays fetch with Scarlett and at her soccer match Scarlett cheered her on. The TV show presents quite a different story. Scarlett was given to Sophie for the pet adoptions by her disappointed owner, so Olivia took care of her and tried to train Scarlett. The little dog ran away causing many mishaps during the chase but allowing Olivia to meet new friends including Andrea, Emma, Mia and Stephanie. Olivia ends up adopting Scarlett. This page was last edited on 11 July 2017, at 22:10.